A Chicago man's reconnaissance trips to India played a pivotal role in the November 2008 Mumbai terrorist attacks, federal prosecutors said Monday. David Coleman Headley has been charged with six counts of conspiracy to bomb public places in India, to murder Americans and others in India, and to provide material support to the Pakistani terrorist group Lashkar-e-Taiba. Headley originally was arrested in October on charges he planned attacks on high profile targets in Denmark and India that included the Danish newspaper facilities of Jyllands-Posten, the Danish newspaper and its employees. The new charges filed in the Northern District of Illinois accuse Headley, an American citizen born in Pakistan, of helping facilitate last year's deadly Mumbai attacks that killed approximately 170 people, including six Americans, and injured hundreds. Additionally, a criminal complaint also unsealed in federal court in Chicago charges Abdur Rehman Hashim Syed (Abdur Rehman), a retired Pakistan military official, of conspiring to plot an attack against Jyllands-Posten and its employees. Headley allegedly attended terrorist training camps run by Lashkar-e-Taiba (LeT), which is believed to be behind the Mumbai attacks. Headley reportedly conspired with members of the LeT to plot attacks in Denmark and India. Over a span of two years, authorities say, Headley conducted extensive surveillance of sites targeted in the Mumbai attacks. If convicted on all the charges, both Headley and Rehman face a maximum sentence of life in prison. 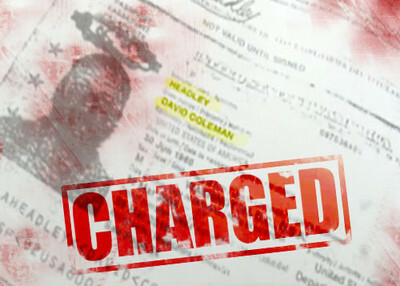 In a release, prosecutors disclose that Headley is cooperating with federal investigators. U.S. Attorney Patrick Fitzgerald indicated these charges may not be the last filed in this case. "This investigation remains active and ongoing. The team of prosecutors and agents will continue to seek charges against the other persons responsible for the attacks," Fitzgerald said in a statement. Headley, born in Pakistan as Daood Gilani, changed his name in 2005 to escape notice as a Muslim or Pakistani and allow for easy transit through immigration on his reconnaissance missions to India for LeT. Headley also ran an immigration office out of Mumbai to serve as a cover for his surveillance activities. Between 2006 and 2008, he reportedly made five trips to Mumbai, where he checked out possible targets, including the Taj Mahal and Oberoi hotels, the Nariman House, the Chhatrapati Shivaji Terminus train station, and the Leopold Café. Each of those places was attacked by terrorists in November 2008. Headley allegedly returned to Pakistan after each trip to India to brief Lashkar members and show photos and videos of potential targets. During a March 2008 visit, Headley discussed potential landing sites for terrorists to enter India from Pakistan, via the Arabian Sea, in preparation for the Mumbai attacks. In those attacks, 10 armed terrorists from the Pakistani port of Karachi landed in Mumbai by boat to carry out attacks on prominent targets in the city. Headley allegedly conspired with Ilyas Kashmir, leader of al Qaeda's deadly 311 Brigade and the Azad Kashmir section of the Harkat Jihad-al-Islami (HuJI) that has carried out terrorist attacks in Kashmir, to plan an attack against facilities of Jyllands-Posten and two of its employees. The Danish newspaper published cartoons of the Prophet Mohammad four years ago that resulted in violent protests across the Muslim world. In January 2009, Headley reportedly traveled from Chicago to Copenhagen in Denmark to conduct surveillance of the Jyllands-Posten offices. Headley reportedly met with Kashmiri in Pakistan on several occasions to discuss plans for the attack and review surveillance videos. Headley in fact was arrested in October 2009 at Chicago's O'Hare International Airport while he was on his way to Pakistan to deliver the approximately 13 surveillance videos of the Jyllands-Posten offices to Kashmiri. The new charges against Abdur Rehman allege that he facilitated contacts between Headley and members of Lashkar and other terrorist groups in Pakistan including a 2009 trip to Pakistan in which Abdur Rehman helped set up a meeting between Headley and Kashmiri to solicit support of Kashmiri's group in the planned attack on Jyllands-Posten. Rehman's involvement underscores the role of Pakistan's military establishment, including its Inter-Services Intelligence (ISI), in backing terrorist groups such as the LeT as a means to wage a low-intensity proxy war against India.